Advent always seems a little further than it is to me ... and suddenly, I flip the calendar and there it is! A new Advent season in preparation for Christmas. 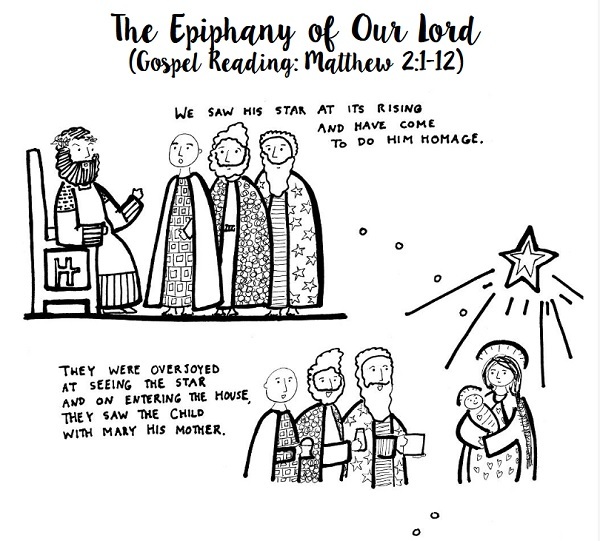 Fortunately, Advent is also my favorite liturgical season, so I've drawn, written, and thought about it throughout the whole year. My Etsy shop is well-stocked for the 2018 Advent season, which begins on Sunday, December 2, with favorites, such as Jesse Tree ornaments (in different sizes and shapes), and the digital coloring books that launched my shop, Christmas in Sweden and Las Posadas Christmas. 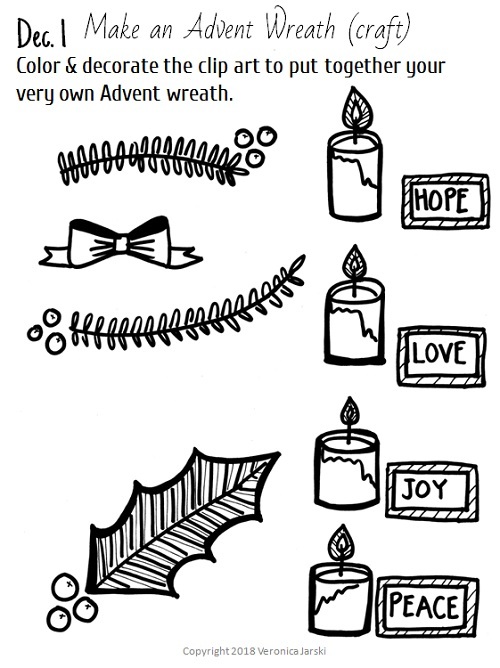 I've also updated my Advent Activities & Coloring book with some new drawings for you as well as hand-picked other favorites from previous publications. To get this digital Advent coloring and activity book for just $10, visit my Etsy shop, purchase, and download it all superfast! (And if you're a religious instructor, DRE, or small-group leader, I've also the same digital book available with licensing permission for all your students for just $17. and have come to do him homage..."
Download entire coloring page here! For the past two years, I volunteered at the Liturgy of the Word for Children at one of our Masses. To help keep the children engaged, I always drew the Sunday Gospel reading on the enormous dry-erase board in our meeting place. Recently, I've been thinking how much fun it'd be to have an actual printable to accompany the Sunday Gospel. 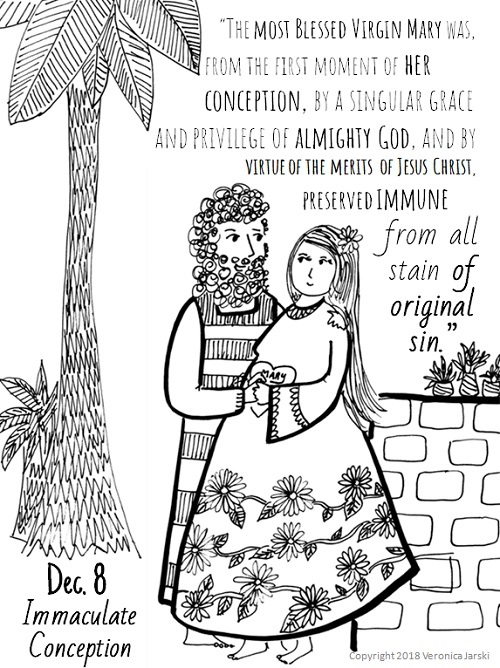 And so, I drew up one for this Sunday: an Epiphany of Our Lord Jesus Christ Coloring Page. * All rights reserved. 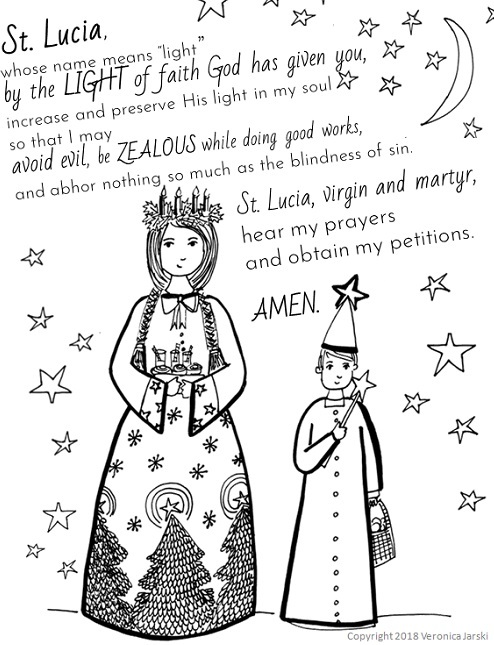 You may use my Epiphany coloring page for your family, homeschool group, and Faith Formation program but not for your company, work, or financial gain of any sort. Questions? Email me at mypaperdali@gmail.com. When I was a child, the feast day of Saint Nicholas had a hazy, almost mythical quality to it. My parents spoke of putting out their shoes at night and receiving gifts by morning on December 6, but they did not carry the tradition for us children. The feast day was something from the homeland, not something to be celebrated in the United States, and it bore little importance to real life. December 6 came and went for many years of my life without much attention except for a vague thought in the back of my mind that "oh, it's the feast day of the guy who became Santa." Then, I became a mother and learned about this patron saint of children. The hazy outline of Saint Nicholas became stronger, and his personality boldly marked. 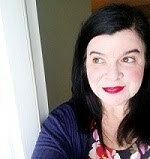 This was not a soft, cozy sort of apparition from the past. 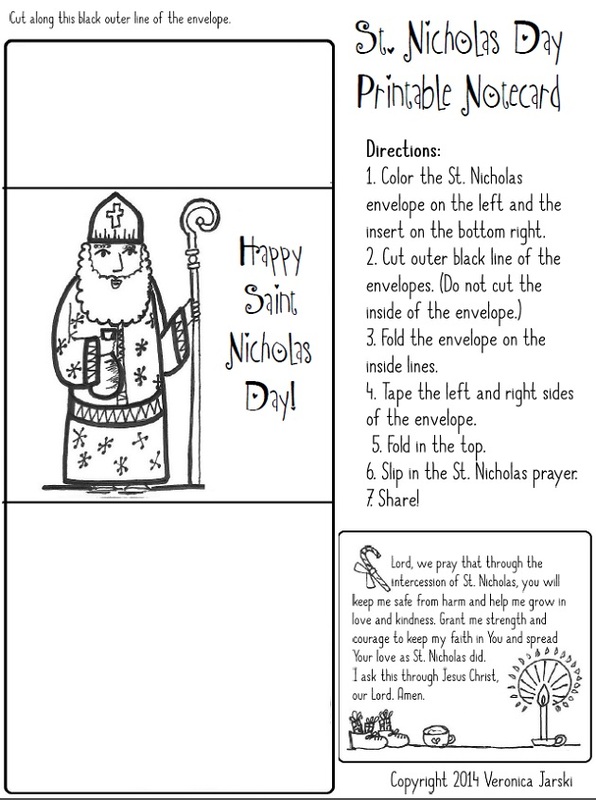 Saint Nicholas was a brave and fiery bishop during turbulent times. After reading Elizabeth Foss's brilliant "Real Learning: Education in the Heart of the Home" book, my husband and I made a conscious decision to celebrate the liturgical cycle, to learn and grow and pray about the meanings of the different days the Church sets aside for us to celebrate. Saint Nicholas came into our life then ... and we've never let go. This bishop, with his generosity and kindness and steadfast spirit, inspired his community so long ago and continues to inspire so many, many others today. He's far more than this vague prototype of Santa Claus. He's not just an old-timey version of Santa. He was fiery in his faith and defender of the Church's teachings. 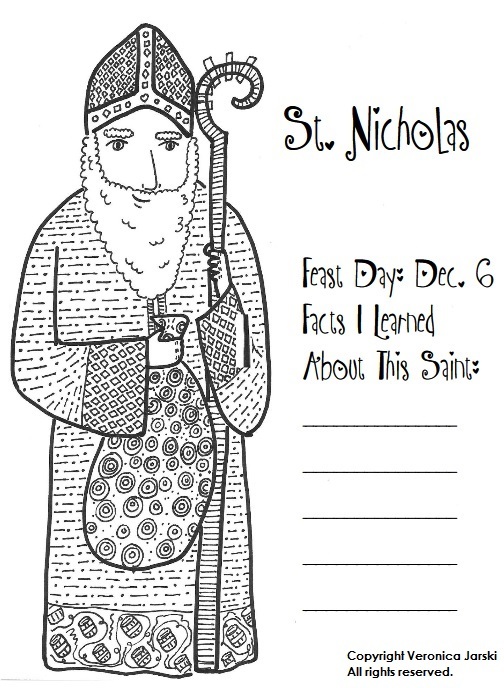 Download this Saint Nick coloring page! May this saintly bishop bless you and your family today and always. Ah, December and all its wonderful Catholic feast days! You sit down to make some plans for your favorite days, but then you realize just HOW many feast days there are in December and how maybe keeping everything organized can be a bear. Oh, right. Yes, choosing just a few can be difficult. Once we do, though, we make sure to highlight, underline, and bold that day on our calendar and also consider why we're celebrating. What about this saint or feast day speaks to us specifically? Because we're Catholic, we do love our food and drink! Find inspiration from the saint's own life or homeland. To get to that point, we often read about a saint's life or watch a movie about the saint's life. (Formed.org in particular has a good selection of saint movies for families.) If we give ourselves more room in the planning, we can pick up books about the saint as well. Download the free Catholic feast day planning page and start preppin' for all the upcoming feast days. A good friend of mine used to greet everyone on the first Sunday of Advent with a hearty, "Happy new year!" As Catholics, we begin our new year in the spirit of "preparation that directs our hearts and minds to Christ’s second coming at the end of time and also to the anniversary of the Lord’s birth on Christmas." This year, December 3 launches us into a whole new year of Catholic feasts and fasts, celebrations that ask us to pray more and hope harder, to draw closer and deeper into our relationship with Jesus Christ ... and we Catholics unite in the prayers and feasts of the season, no matter where we are, all around the world. When my husband was in RCIA (Rite of Christian Initiation of Adults) years ago, he was astonished that all Catholics followed the same calendar of celebration. "Everyone has the same Mass readings every day?" he asked in surprise. "And everyone in the whole world is listening to the same Gospel and prayers?" That wonder he felt many years ago still resides in our home ... in me, in our children. It especially shines during Advent, when we excitedly put together our Advent wreath, fill up our little tabletop basket with the beautiful Magnificat Advent prayer books our parish gives our community, and place ourselves along the long journey of St. Joseph and Mary toward Bethlehem. Advent, Christmas, Ordinary Time, Lent, Easter, Ordinary Time again ... then a new year begins once more on the first Sunday of Advent. 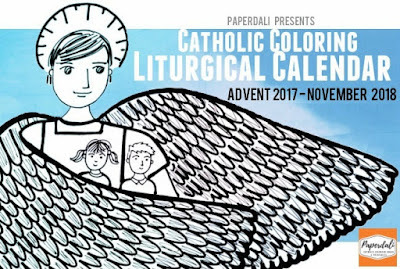 In preparation of the new liturgical year, I put together a downloadable (and affordable) Catholic Liturgical Calendar to Color 2018. 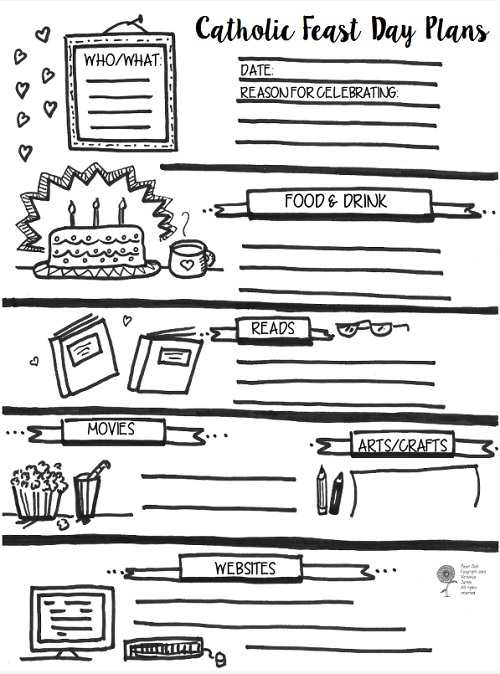 You may also want to grab this free Catholic feast day planning printable. And remember to wish your Catholic friends a happy new year on December 3, 2017!